Notice how all of the charts above move to the right and up. After closely monitoring and researching the developments of the stocks listed above, I can confidently tell you that improving fundamentals and strong business developments are the reasons behind these price actions, rather than a "Frost feeding frenzy". Bozza's bearish report on Opko dedicates a section to the associated business partners and public entities of Dr. Frost, and labels two of Frost's partners as "serial stock promoters". Bozza highlights questionable business practices from the past, noting that one company (Tiger Media, shown above) was revealed to be a fraud, and that Frost's business partners have been subject to multiple lawsuits. 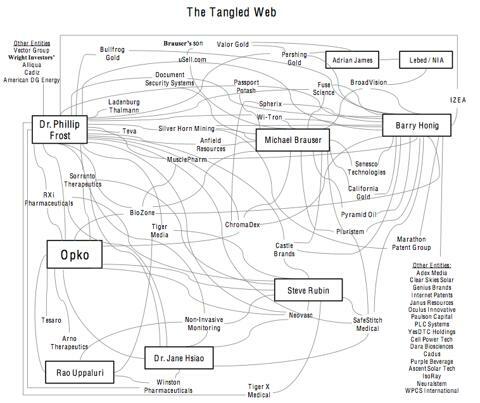 Bozza includes a tangled graphic of Frost and his associated holdings, which is quite revealing. 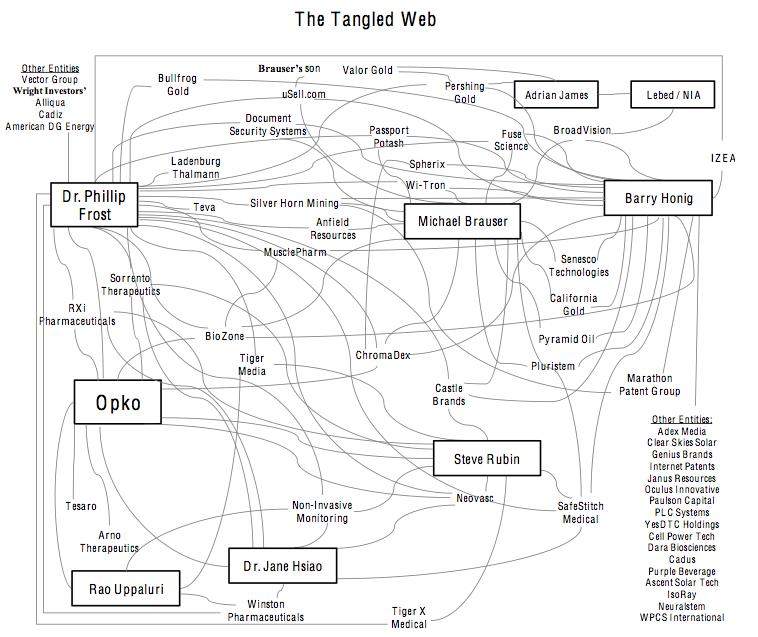 This chart should label Frost associates Michael Brauser and Barry Honig as serial entrepreneurs rather than promoters. Since Bozza's comments on Wednesday, several companies listed above have taken a hit, offering a prime entry point for the speculative investor. Some of the more promising investments are listed below. Neovasc's shares have shed more than 10% since Bozza's comments. The small cap medical device company has a promising set of catalysts approaching for its core tissue division and for its two life saving vascular devices, The Reducer and The Tiara. The Reducer recently released extremely positive top line results of its sham-controlled COSIRA trial, and full results should be released by the end of the month. The device is already CE marked in Europe, and is the first minimally invasive treatment for Refractory Angina. Based off of comparable devices, the device can be worth anywhere from $5.00 to $14.00 per share. The Tiara has received an extremely broad patent for treating Mitral Regurgitation, and is the frontrunner in bringing an effective product to the market for the first time ever. Neovasc tested the device in animals and recently published strong data supporting the safety and efficacy of the device. The first human implantation is scheduled for Q1 of 2014. If approved and brought to market, this would be a billion dollar device. Neovasc's Peripatch tissue division continues to boast strong growth and profit numbers, as shown in its latest quarterly filing. This profitable division should see increased revenues as more of Neovasc's customers gain FDA approval for their vascular devices that utilize Neovasc's Peripatch tissue. The profit generated from the tissue division funds the development of The Reducer and The Tiara, which is unique for a small medical company, which would usually have to rely on secondary offerings (dilution) to generate the necessary development funds. The expanding growth of Neovasc and its tissue division will not end anytime soon as they finalize the divestment of its low margin patch division and benefit from the rapidly growing heart valve market. Bozzo's Opko report includes a sentence about Neovasc, which states, "So far in 2013, Neovasc has generated operating losses of C$ 4.8 million and has a book value of just C$7.4 million." This shortsighted statement does not provide a picture of the tremendous shareholder value that has been built at Neovasc over the years. The initial team that was put together in China was dismissed. And we have a new CEO in place, Peter Tan, who is a terrific guy. I just came back from Shanghai a few days ago and met with the people in their offices. It's functioning beautifully now. We expect the company to be profitable early next year. The installation of their advertising screens are amazing. They're very classy and very elegant. It's a terrific business model now with good management. The new name for that is Tiger Media. That is a company that as often happens, struggled initially, but we think we have a good formula now. We expect it to grow rapidly. I'm an investor there. I'm not managing that business but since I have a significant position I try to keep abreast of what's happening. Shares of Tiger Media dropped more than 10% since Bozza's report was released. The company has been declining for weeks since it hit an intraday high of $2.00 back in October. The recent departure of Tiger's CFO (a career move), and a reduction in the pricing of existing warrants, have left shares trading near key resistance levels. Shares may potentially be putting in a bottom near $1.20, as the company gears up for profitability next year. Here's what Bozza had to say about Tiger Media. The company has since changed its name to Tiger Media and trades for $1.30 per share with Frost still owning 28% of the company. Despite the fact that the company was a disastrous investment for Dr. Frost, that the books turned out to be fake and that the new Tiger Media (still trading under the ticker IDI), recorded no revenues for any of the past three years, Dr. Frost inexplicably continues to buy shares of this seemingly worthless entity with a ~$40 million market capitalization, most recently buying around $250,000 in stock on July 10, 2013. Again, Bozza's statement regarding Tiger Media is focused solely on the past, and he fails to mention any of the positive developments that have recently taken place at the company. TransEnterix is a small cap medical device company that is awaiting FDA approval for its surgical robot, The Surgibot, which is based on its unique Spider System technology. The device is expected to be approved in 2014, and offers several advantages to Intuitive Surgical's Da Vinci System. The Surgibot is a minimally invasive surgical platform that utilizes a single incision that is about the size of a dime. The system has a much smaller footprint than the Da Vinci, will be considerably cheaper for hospitals, and allows surgeons to operate by the patient's side. A brief demonstration of the Spider System technology can be viewed here. Since Bozza's report was released, shares of TransEnterix have shed more than 20% and are entering bargain territory. The company is led by Todd Pope, former executive of Johnson and Johnson, and plans to present at the Stifel Nicolaus MedTech Madness 2013 event on December 16th. The strong likelihood of the Surgibot gaining FDA approval and the disruptive potential that the device possesses makes shares very attractive at these levels, which haven't been touched since the reverse merger between TransEnterix and Safestitch Medical was closed in September. Biozone Pharmaceuticals has been on a rollercoaster recently, after practically becoming a shell company when it sold most of its business to MusclePharm (MSLP). Shortly after the company signed a letter of intent with CoCrystal Discoveries to initiate a reverse merger. CoCrystal was a private company that had received a significant investment from both Opko and Teva (TEVA) back in 2011. The company is focused on creating antiviral therapies to treat hepatitis C, influenza, the rhinovirus, and more. The company's Chief Scientist is Roger Kornberg, who received the Nobel Prize in Chemistry in 2006, and is a board member of Teva. The company has been utilizing high throughput x-ray crystallography and other methods developed by Kornberg to "develop superior versions of existing drug, as well as first in class drugs." CoCrystal offers far more value than any of the Biozone assets that were recently sold off to MusclePharm, and investors should view this as an early stage medical company that seems to have made progress in the development of their five unique therapies (CoCrystal has been in operation since 2008). Still in the early development stage, Biozone remains a risky investment, but shares do look appealing as a long term play after dropping more than 10% since Bozza's comments. In the more than four years since Opko made its investment, there has been little apparent progress at Cocrystal as disclosed by Opko and the book value of the investment is just $2.5 million. For the third time, Bozza has issued a shortsighted statement that solely focuses on the past and does not account for any of the positive developments that have recently occurred. While Bozza has extensively studied the ins and outs of Opko Health, he has failed to understand the core competencies of several Frost related investments. All long Opko investors and Phillip Frost followers should send Anthony Bozza a thank you note this holiday season for creating a unique buying opportunity in several promising stocks. Bozza's constant focus on past developments and his inability to grasp the magnitude of Phillip Frost's business investments and the amount of time it takes for these investments to develop has left the above-mentioned companies trading at a considerable discount. With no business fundamentals changing, the recent drop in Frost related stocks is unwarranted. I believe Bozza has underestimated the integrity of Frost, and Bozza may very well become friends with Frost if he's ever forced to cover his short position. All prospective investors should monitor Opko Health and the above mentioned companies as investor presentations commence and trial results are released. 1 comment to ''The Bozzo Effect: Drop In Frost Related Stocks Presents Buying Opportunity"
Sept 2018.....Dr Frost was accused of insider trading...…..